Those wanting to take a break from the bike or car will find plenty of opportunities for strolling into the wilderness. Just beyond the Tangle Lakes, the Amphitheater Mountains jut out from the Alaska Range. A glacier carved a large hole through the mountains, Landmark Gap. A long finger of water has filled the bottom of the gap and the snowy caps of Mount Moffit and McGinnis Peak rise beyond it. Landmark Gap Lake is a great destination for an easy dayhike or overnighter. The route is a five-mile round trip along an old dirt track to the south shore. 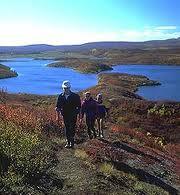 Trails extend along the lake and hikers can proceed through the gap to the north slope of the Amphitheaters. Mclaren Summit, 37 miles west of Paxson, is the high point of the Denali Highway. The summit is a good jumping off point for rambles across the open tundra. An esker heads north from the road, initially with a fading vehicle track. The track shortly veers off, and hikers can continue along the ridge past a variety of lakes and ponds. About five miles out, the ridge tops out at 4,100 feet, with a panorama of the Amphitheater Mountains and the Alaska Range.